Using “mob turncoats” to testify in court doesn’t always work. It comes down to credibility. 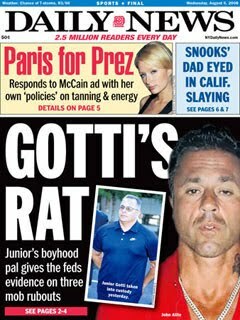 Apparently, jurors weren’t buying what “mob turncoat” John Alite was selling as a star prosecution witness in the the fourth and final unsuccessful trial in 2009 against his ex-best friend, John (Junior) Gotti, son of the late Godfather John Gotti. Alite, a convicted murderer and associate of the Gambino Crime family, testified that the younger Gotti, who was a childhood friend, approved multiple murders. Apparently, his word was no good, at least in the eyes of some jurors. The case ended with a deadlock jury in December 2009, and the government decided after failing four times, not to go for a fifth trial. Gang Land News reports that the feds have “rounded up a slew of better witnesses” in a multiple murder case against John Burke, a Queens gangster. One of the witnesses is expected to be Peter (Bud) Zuccaro, who was a defense witness for Gotti Junior, Gang Land News reported.